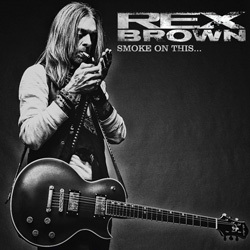 Rex Brown? Pantera and Down? Yep, that’s the guy. Having shifted a shedload of albums as the bassist in a couple of hugely influential bands, Brown has taken a leap of faith and stepped into the limelight with his debut solo album. And it’s a smart move too, as ‘Smoke On This…’ sees Brown delivering a rousing set of eleven new songs, written with collaborators Lance Harvill (guitars) and guitarist/keyboard player/producer Caleb Sherman. ‘Smoke On This…’ is a luscious groove-giant, an album that proclaims its presence as a monster-fest of swaggering Seventies’ style hard rock. Although his days in his previous outfits might have concealed this, in the spotlight Brown wears his influences proudly on his sleeve, and his outing features elements of the likes of Zeppelin, Skynyrd and The Beatles, all mixed up and served up with a liberal helping of feeling, and a touch of Alice In Chains’ ear for that perfect melody. The result is an album which is passionate and intense – no more so than in, say, ‘Buried Alive’ and ‘One Of These Days’ – although its real strength is its integrity and openness. It’s no doubt been a cathartic process for Brown to show what he can actually do when given centre stage, but as an album it’s neither self-indulgent nor domineering. This could be the guy who lives next door, the bloke you give a lift to work to; no pretence, no ego, just someone who likes to play and who has a clutch of great material up his sleeve. Christopher Williams (Accept, Blackfoot, John Corabi etc etc) fleshes out the band behind the drumkit while aside from the bass, Brown handles both guitar and vocals and does both with a great deal of assurance. ‘Smoke On This…’ is a good album; a really good album. It may be one small step for mankind, but it’s a giant leap for Brown. And a well-deserved one, too.